Hotel Trash Deluxe is located in the heart of Maastricht, 300 meters from the Market. Our boutique hotel consists of two buildings with a total of eight unique, contemporary, cozy and spacious rooms. Each room has its own theme that is expressed by the wallpaper and the use of materials. 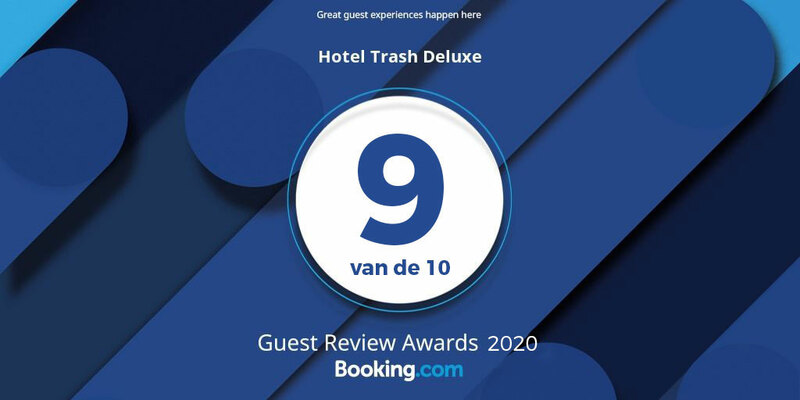 Hotel Trash Deluxe is a so-called "boutique hotel" and individually run with personal attention. For example, we contact you, the day before or the day of arrival, personally by email or by text message, regarding your arrival / stay and you always have contact with maximum 2 different people. Trash is processed into luxury which, for example rubber conveyor belts from local ENCI fabric and old wood stone oven Russian plates, are used as flooring. The cooperation of the old wooden beams in the ceiling with the rest of the interior create a highly distinctive character. We have partnered with artist Maurice Frissen who made several objects of collected waste and Weelec, a company dedicated to and specializes in recovering raw materials from discarded electronics. Every room has a double bed, minibar, flatscreen TV, closet and is at least 25 square metres. We offer every guest free WIFI, waters, fruit and a cup of coffee/tea as a welcome gift! Our reception is open from 08.00 till 14.00 o’clock. If you check-in later you will receive the locker information. This way you can check-in 24 hours a day! Check out is every morning from 08.00 till 10.30 o’clock. Luxe breakfast: several kinds of bread and toppings, yoghurt, muesli, cornflakes, egg, muffin, homemade marmelades, fresh orange juice and coffee/tea. It is not allowed to smoke in the hotel of in the room. We do not have our own parking but you can park at the Qpark Sphinx for 13 euro per 24 hours. You will see a sign at our doorstep to assist. It is possible to bring your dog with you, please notice us before your arrival. Other pets are not allowed. Go to 53/54 Hasselt. At the lights you go right, up on the bridge. Take exit 3 to the market. At the lights you go to the right. Keep going straight to the Boschstraat. After 400 meters the hotel is at your left. From the Central Station you can take bus 1/2/5/6/8/9 travel to the Boschstraat / Maagdendries . The bus station is across the street. We would love to welcome you so click here to make your reservation!